MOST (Modular Object Scanning Technology) is a comprehensive scanning solution which consists of customizable modular components. MOST provides full management and customization of multi-functional device activities, including emailing, file saving, workflow, archiving, and faxing. MOST provides a What-You-See-Is-What-You-Get console interface design tool that offers an easy way to create, manage and deploy users, groups and MFP interfaces. MOST has the capability to grant users and groups access to specific MFP functions based on their credentials. It can also keep track of copy activity on a per MFP, user, or group basis. MOST Alerts can send out notifications to the appropriate persons about various MFP statuses. MOST also offers RSA/SSL encryption, Active Directory (LDAP) authentication and integration with other third-party products to produce a highly scalable solution that will meet the demands of any organization. Printers can be used with MOST to release prints using the Print To Me technology. The MOST software is installed on one or more Windows Servers. The MOST Client Application is installed onto a variety of MFPs, printers, or desktops. When MOST is used to process documents, the documents are scanned and sent to the MOST Manager on one of the MOST servers. The MOST Manager will process the documents based on the settings configured on the MOST server. Once processing is complete, the documents are sent to the distribution service. From the Reform distribution service, the documents are printed, faxed, emailed or archived as indicated by the Tab settings and user input. For software and hardware requirements: click here. 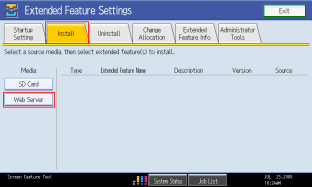 To install MOST, download and run the MOST installation routine found at www.fabsoft.com in the Downloads section. The installer will launch. To install MOST, click Next and the process will begin. MOST will install SQL Server Express and .NET Framework requirements if they are not already present. After it completes, click Finish. MOST is now installed. For details on evaluating Reform: click here. For details on licensing and registration: click here. 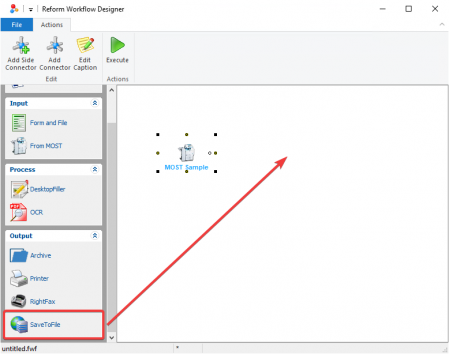 In this tutorial, we’re going to be using the included MOST Desktop emulator to simulate an MFP running MOST and connecting to a MOST server. Essentially, whatever you can do on the MFP, you can do using MOST Desktop. Therefore, there is no MFP required for this portion of the tutorial. We will then use one of the MOST tabs that are included with the default MOST installation to perform a Scan To Folder operation, which will scan pages from your MFP and save them to a file on your computer. The first thing we need to do is start the server side of the MOST application so that we can connect to it from MOST Desktop. Open the MOST Manager application by navigating to your desktop and clicking on FabSoft Reform folder, then the MOST then on Manager. The MOST Manager will load and the server will be started. You can see that the MOST Manager is running by looking in the bottom left corner of the window for the status text. Make sure that it is started; if it is not, click the green Play button on the top left of the window. 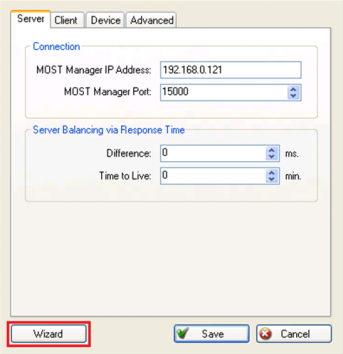 We also need to get the IP address of the server, so in the left tree view, click on Manager, and take note of the IP. Next, run MOST Desktop application by navigating by clicking on the desktop folder FabSoft Reform, then the MOST then MOST Desktop. Enter in with the username demo and the password demo. This account is automatically set up when you first install MOST. The emulator will now connect to the MOST server and login. Once it logs in, you will see a series of collections and tabs. 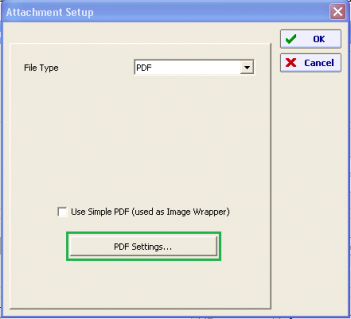 For this tutorial, we will be using the Home tab in the Scan to Folder collection. To access the Shared tab, click Homeon the left side of the screen. You will notice several fields on the tab. The File Name field is where you can enter the name of the output file that will be generated when you scan. The list in the middle of the screen is the folder list that is located in C:\temp on the MOST server. To view the subfolders, use the + to expand the temp folder. (Note: C:\temp folder is created during the installation of MOST. If for any reason your Listbox is not populated, check and make sure the temp folder and the subfolders exist otherwise you’ll need to create them.) For this example, we will be selecting the Test 2 directory and giving the file the name of ’demo test’. Click on Test 2 in the folder list to select it, and then enter ’demo test’ in the filename field. For this example, we can leave the rest of the fields as their defaults. Ensure that your tab looks like the screenshot above. Then click the Scan button. MOST Desktop will allow you to choose an image to simulate scanning. You also have the ability to use an attached scanner to scan a document. For Filter, select the file type you will be browsing for. 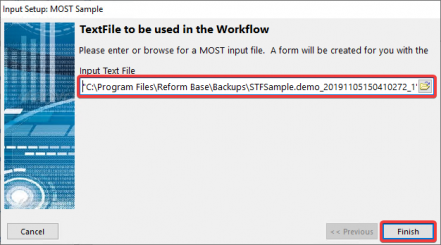 For this demonstration, we have included a TIF file named SampleTif.tif in C:\Program Files\Reform…\Misc\ that can be used. If you have any TIF/JPG that you would like to use, you can do so as well by selecting the appropriate Filter in the drop down box. Click Browse… to navigate your hard drive for the file type you selected. Select a file and click Open. Click OK and your process is complete. After a few seconds, go into the Status tab on the left side of the screen. 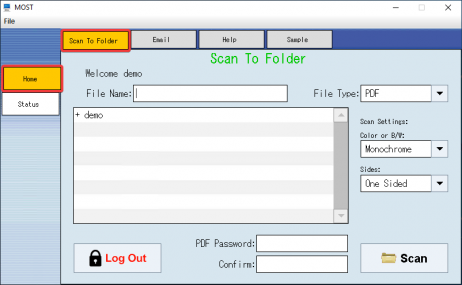 Once the Reform Spooler has processed the file, you will be given a status about the results of the scan. If the file was saved correctly in the directory, the status will say Successful. You can also see the result file in the folder that was selected. In our case, it was C:\temp\Test2. If you navigate to this folder, you will see ’demo test.PDF’. It will contain the image(s) chosen in MOST Desktop. With the default MOST installation, there are three Collections installed: Scan To Folder and Email. The Scan To Folder collection consists of four tabs: Home, Simple Home, Shared and Status. The Email collection consists of five tabs: Email, Simple Email, Email Self, Multi and Status. These screens can be used as a template or altered to fit your requirements. Home – The LDAP tab gives users access to their Home Directory (LDAP must be enabled and home directories must be configured on the LDAP system). Users have the ability to browse to available folders in their home directories. These screens gives options for file name and scan settings. 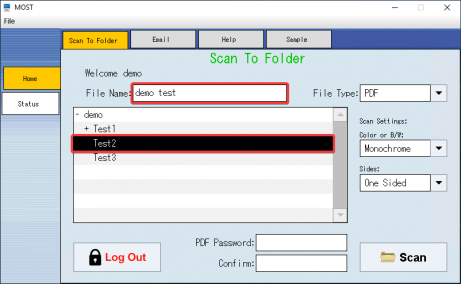 In addition, it also allows users to select an output file type of either PDF or TIF and set a PDF password (if using PDF). 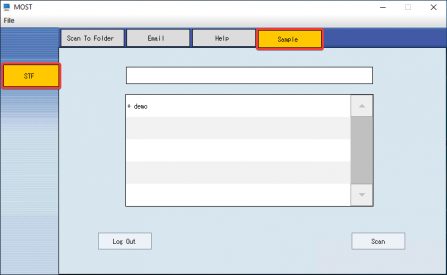 Simple Home – Similar to LDAP, this tab allows you to scan to your Home Directory. Instead of having a choice of a sub folder, here you scan directly to the root of your Home Directory. The location of your home directory is displayed for your convenience. Shared– The Manual tab gives the user access to the C:\Temp\ directory by default. The directory can be changed to any location, including a share network path. 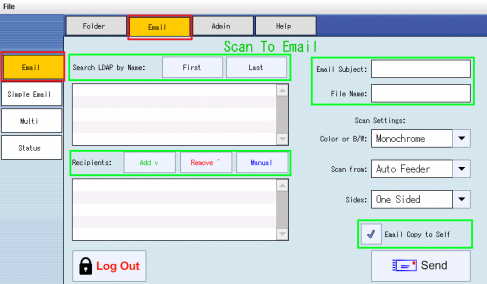 Users can enter a file name, configure scan settings and use one of two scan buttons (Scan and Scan with Preview). Status – The Status tab shows the results of your Scan To Folder activity. It only displays the results of the user that is logged into MOST. It breaks down each scan by the time the document was scanned, the filename and the status (Successful or Failed). 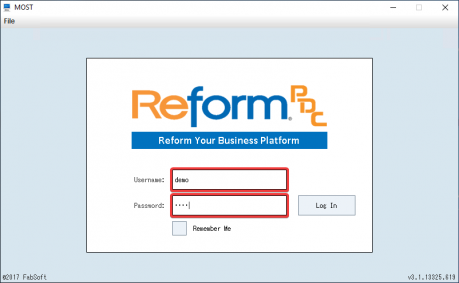 NOTE: The Reform Email plugin is required in order to send emails using the Email tab. 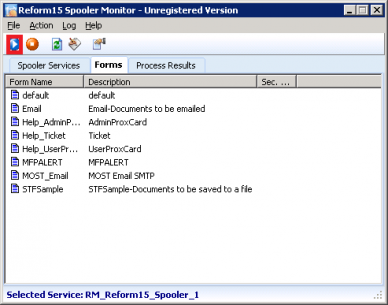 It is recommended that the RM_Email_Monitor service has a local administrative service logon account. Please see the Reform Email manual for more information. 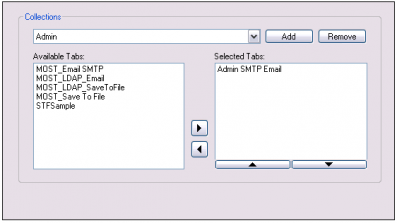 Email – The LDAP tab gives users the most powerful approach to email by utilizing LDAP and Exchange searching. Users can add recipients based on searches using first and last name. 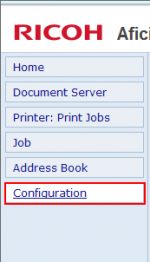 Manual addresses can be added as well by using the Manual button. An "Email Copy to Self" option is also available by checking the box above the Send button. 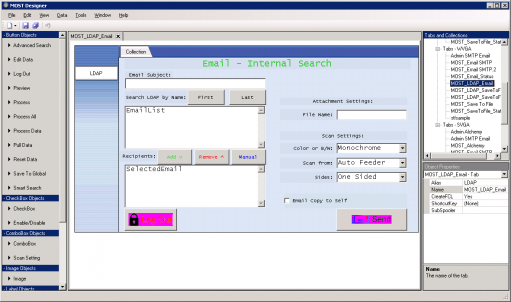 Simple Email – The Email tab is the simplest tab in the Email collection. It gives user the option to manually type in email addresses in the Email To field, as well as fields for a subject and body. Multi – The Multi tab gives the user a better approach to email by giving more options such as PDF Password and the Email To Self checkbox. The "Add a Recipient" button is used to populate the Recipients list with email addresses. Status – The Status tab displays the results of your sent emails. It breaks each email down by date and time submitted, email recipient and status (Successful, Failed or Retrying). 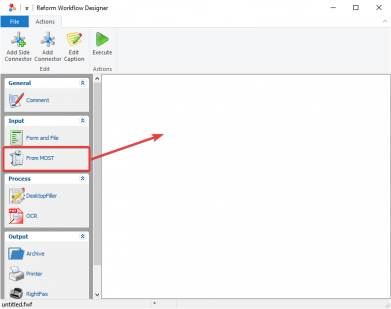 This guide will walk you through creating your first fully-functional MOST tab that will scan pages from the MFP and save them as a PDF file on your hard drive. It requires Reform Enterprise/PDC and MOST to be already installed on your system. 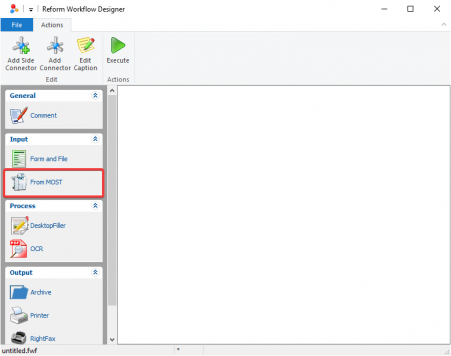 Open the Designer application by navigating by clicking on the desktop folder FabSoft Reform, then the MOST then on Designer. On versions of Windows with a Start bar, it can also be found in Start > Programs > Reform… > MOST > Designer. Depending on the screen size of the MFP you are using, please select the appropriate option. When you create a new tab, the New Tab Wizard will appear. 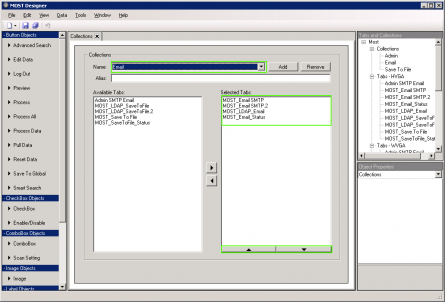 The wizard will allow you to set the values of several properties of the tab. Collections: add a new collection and name it Sample. Users and Groups: Check the box next to demo. Click Finish. After you finish stepping through the New Tab Wizard, your tab will be created. For the example, we created a WVGA tab, but the results will be the same regardless of the size of the tab you created. We are going to add several objects to the tab. You will notice the list of items on the left pane. Scroll down to find the TextBox object. Click on TextBox and drag it on to the tab, as shown below. Next, we will be adding a Tree Listbox Object to our tab. Add it to the tab the same way you added the TextBox by clicking and dragging the Tree ListBox object on to the tab. Next, we will be adding a Log Out button to our form. Find Log Out under Button Objects in the object list, and drag it on to the tab. Next, we will be adding a Process button to our form. Find Process under Button Objects in the object list, and drag it on to the tab. Go to File > Save to save your tab. Next, we need to make sure the Reform Spooler is stopped. Open the Spooler by going to Start > Programs > Reform… > Spooler. Once it opens, click the Stop button on the top left. Once the Spooler has been stopped, log into MOST Desktop located on your desktop if you made a shortcut previously or at Start > Programs > Reform… > MOST > Misc > MOST Desktop. Once it connects and logs in, select your new collection Sample, and your tab STF. 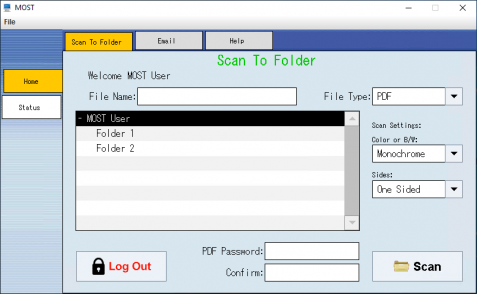 Now let’s fill in some basic information on our tab and perform a Scan To Folder. In the top TextBox, enter the text SampleFileName. 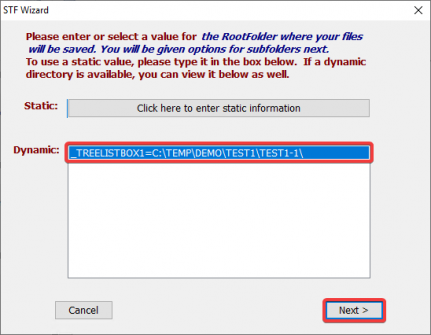 In the Tree ListBox, expand the temp folder, select Test and then Test 1-1. Last, press Scan. If you are at an MFP, it will scan any pages that are in the feeder and ask you if you are finished. 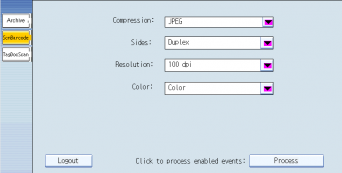 If you are using MOST Desktop, you will be prompted to select an image to simulate scanning. For assistance on how to do so, please see "First-Time MOST Setup and Connection Test": Step 15. 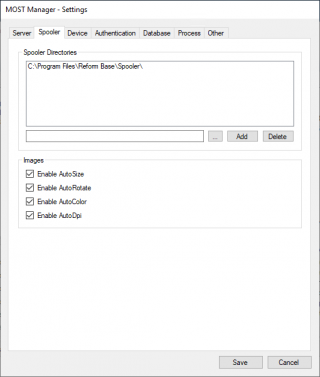 Select an image and click OK.
After the process completes, 2 files will be created in your Reform Spooler folder. Since we stopped the Reform Spooler, the files will not be processed yet. Open an Explorer window and navigate to C:\Program Files\Reform…\Spooler. You will notice two files in this directory. They have the same file names, aside from the extensions, so they will be processed together. These were created by MOST to be processed by Reform. We need to create a workflow that will handle processing data that you submit from the MOST tab we just created. Open the Workflow Designer. Click Start > Programs > Reform… > Workflow Designer. It will allow us to create the forms we need to finish our process. You will notice that your Inputs, Processes and Outputs have been populated by the various plugins you might have installed, where MOST is one of the Inputs. We must first drag a From MOST object onto the workflow. To do so, hover your mouse over From MOST until the cursor turns into the small hand and From MOST becomes underlined. Then click and hold your left mouse button and drag the object onto the whitespace or digital workflow. Release the mouse button once you have your desired position. Note: You will be prompted with a dialog to describe the input. Enter a description for the object you just added. This is done by typing in the provided box. Type "MOST Sample" and click Finish. This will take you back to your workflow. 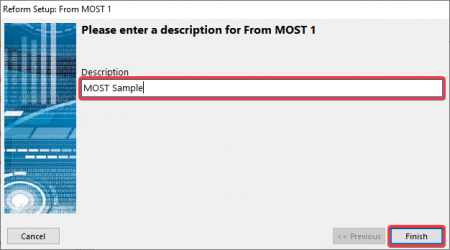 To configure the "MOST Sample" Input, you must right click on "MOST Sample" and select Configuration… This can also be done by double clicking on the "MOST Sample" object. You will be prompted to select one of the two previosuly mentioned files which were created by MOST for Reform to process. 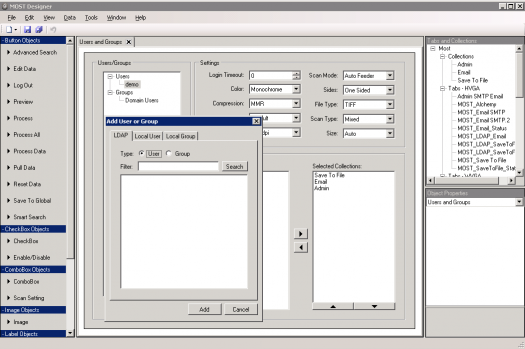 Selecting the file will automatically create a blank form for you with the same name as the file (STFSample.FOM). Click the small folder icon and you will be taken to a browser window. 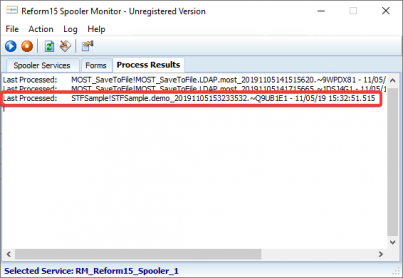 Navigate to the Spooler Directory (C:\Program Files\Reform…\Spooler) and select either of the two STFSample files. After doing so, click Open. Verify that the correct file is selected and click Finish. You will notice that your "MOST Sample" caption has turned blue because it has been configured. Next, since we are doing a scan to PDF workflow, we need a SaveToFile Output to complete it. Drag a SaveToFile object underneath "MOST Sample". Once added to the workflow, you will be prompted to describe the newly added Output. Type "SampleFile" in the box provided and click Finish. Once you click Finish, you are taken back to your workflow. Your "SampleFile" Output will have a Red Caption because it is not yet configured. To configure "SampleFile", you must first connect the From MOST object titled "MOST Sample". To do so, first select the "Add Connector" button from the menu bar. Next, drag your mouse from the small "x" underneath "MOST Sample" to the small "x" above "SampleFile" as pictured below. When the connection is complete, the connecter will turn black (if red, the connection has not been made correctly, try again) and the "MOST Sample" caption will turn green. When the connection is made correctly, you will be prompted to configure "SampleFile". Click Yes. The SaveToFile wizard will now guide you through the necessary steps to get the correct output file in the correct location. It uses information from the file that you selected while configuring "MOST Sample". 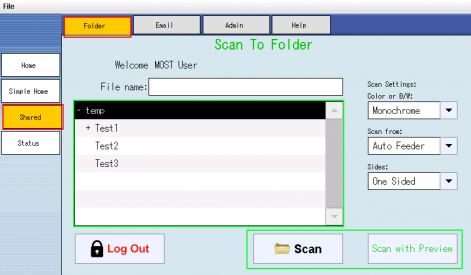 This file has all the information the user selected while at the MFP screen or through MOST Desktop. The first prompt is the type of file you want to save. Select "PDF File" and click Next. Next is the directory where the file will be saved. If you remember correctly, this directory (C:\Temp\Test1\Test1-1\) should be part of the information in the file we selected. To use the information stored in the data file, click the button titled "Click here to select variable information". This will reveal a list box with available directories. As you can see, the list box (_LISTBOX1) which we created in our sample tab is listed. Select _LISTBOX1 from the list and click Next. It will now ask you to select a subfolder. For this demonstration we do not require one so you can click Stop Looping. The final prompt is for the FileName. Since the filename has already been specified in the file that MOST generated, we want to click the button titled "Click here to select variable information". This will reveal a list which available data in the file generated by MOST. As you can see, _TEXTBOX1 was the object we created on the tab which held the name of our file. We want to select _TEXTBOX1 from the list and click Finish. You have completed configuring your workflow, but no changes have been made to your form just yet. You will notice that both captions are now green since they have been successfully configured. You have the ability to save the workflow you just created to a file, so that it can be accessed in the future in case you want to reconfigure something on the form. This is done by going to File > Save in the Workflow Designer and is optional for our example. You can now exit the Workflow Designer. Open the Reform Spooler. Click the Refresh button. You will now see your new form STFSample in the form list. The form was automatically saved by the wizard and the filename was taken from the print stream that it was set up with. The spooler files that were created earlier will now be processed by the new form that we created. Click the Process Results tab in Reform Spooler to view this information. This will save the pages you scanned earlier and save them into a PDF file that you can see in C:\Temp\Test1\Test1-1. Now you can go back to your MFP or MOST Desktop and utilize your newly created tab. If the Reform Spooler is running, the process you configured will be carried out automatically for you. 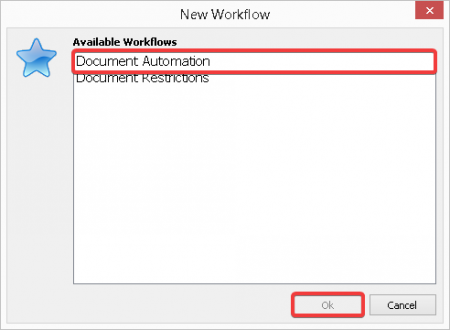 Keep in mind that while we performed a simple SaveToFile in this example, it would be very easy to configure your scanned documents to be archived, emailed, or faxed, just by adding different devices to the digital workflow in the Workflow Designer. There are four components to MOST: the MFP Application, the MOST Manager, the MOST Designer and the MFP Control Center. Below is a brief description of each component. To find these application go to your desktop and select on FabSoft Reform, then the MOST folder. The application resides within the MFP and consists of several visual interface components that are accessible through the touch screen panel or MFP console controls. The MOST Manager resides on the delivery service server. The MOST Manager must be running if service mode is off for MOST to operate. 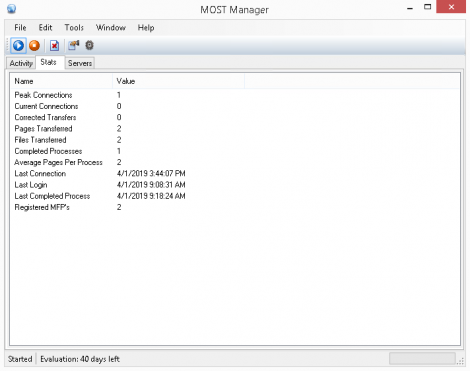 The MOST Manager can also be configured to run as a Windows service that can be started automatically. 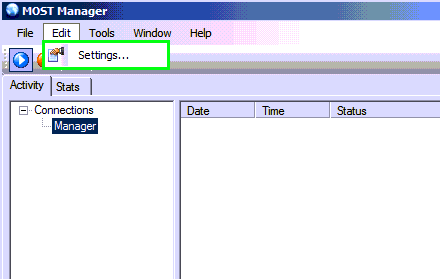 The MOST Manager is used to configure delivery settings used by MOST. You can configure server IPs, encryption, database information, logging, synchronization and other settings using the MOST Manager. 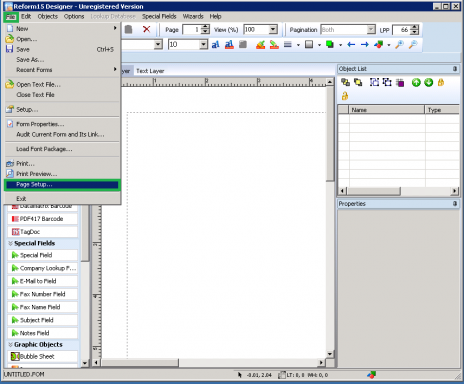 The MOST Designer is a graphical tool that is used to create and manage users and groups of users. It also features a drag and drop interface to enable easy development, modification and deployment of new Tabs and Collections. The MFP Control Center allows MOST to be installed from a computer onto an MFP. You can specify specific IP addresses or a range to make installation simpler. The MOST Desktop Application can be run on the server or as a stand-alone client on a workstation. It is used to simulate an MFP. 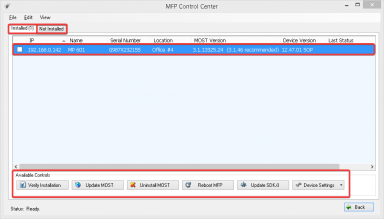 Open the MFP Control Center application by navigating by clicking on the desktop folder FabSoft Reform, then the MOST than on "Install To MFPs". On the MFP Control Center, click Edit > MOST Settings… for the manufacturer of the MFP or printer being used. Click the Wizard button in the bottom left of the window. 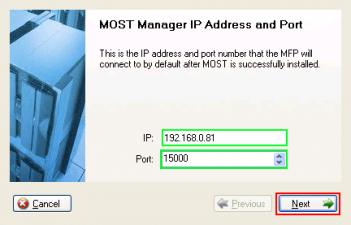 The MOST Manager IP Address and Port Window will be displayed. Verify the IP of the MFP on which you are installing MOST. 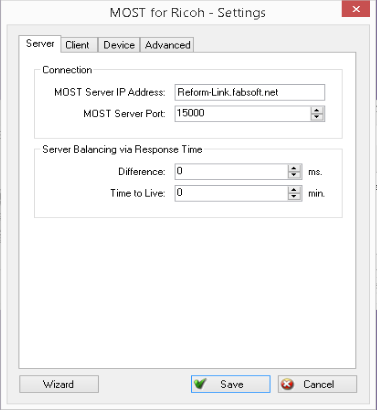 It should automatically pick up the IP of the server you are on and the port 15000. If not, correct it. The Login Window Image Address window will be displayed. 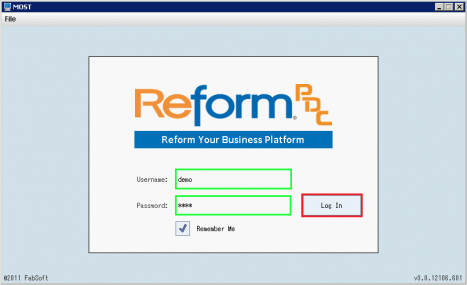 Here you can customize the login window which will be displayed at the MFP or on MOST Desktop. The image size used by default is: 342 (width) x 152 (height) pixels. Color screens can have up to 256 colors (8 bit depth). Browse for an image if you wish to do so. If not, the default will be used. The Copy Counter window will be displayed. The Copy Counter setting enables the MFP to have control over users’ copying habits. 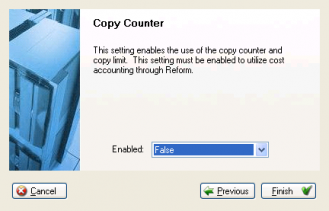 The Reform Tracker plugin is required in order to utilize the Copy Counter feature. For now leave this set to False. 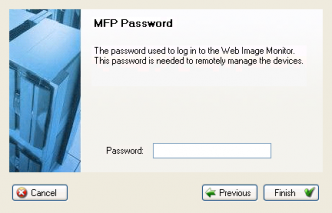 The MFP Password should be the same as the credentials used to log into the MFP’s Web Image Monitor. If the scan fails, Click Edit. Click OFF SNMP mode and try again. A window appears with two tabs: Installed and not installed. Depending on whether MOST has already been installed on the MFP it found, it will appear on the appropriate tab. Installed Tab - lists devices within the IP range that have MOST installed. Check the box(es) next to the device(s) to which you wish to deploy. 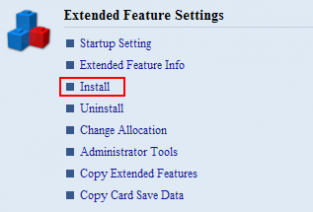 When the installation is done on a clean MFP (Not installed tab), the MFP will disappear from the Not Installed tab and appear in the Installed Tab. The Status at the bottom of the window will also indicate Ready. Once it confirms that MOST has been installed, you can close the MFP Control Center window which has the Installed and Not Installed tabs or click Back. This will take you back to the main window. You can close this window as well. You have completed your installation of MOST on the MFP(s). You can now try logging into MOST from the MFP. The MOST Manager controls the MOST service and contains various configuration settings for the MOST Server. It is an essential component of MOST and must be running for MOST to properly function. Open the MOST Manager. By default, the MOST Manager server runs automatically as a service. You can check the status of the MOST Manager in the bottom left hand corner. Similarly, the red square will be depressed if the MOST Manager is off. Open the Setup window from the menu: select Edit > Settings, or click the button. The Available Servers is where the IP addresses are added for other servers running MOST. This will allow the MFP to determine which server to use based on a ’round robin’ approach. 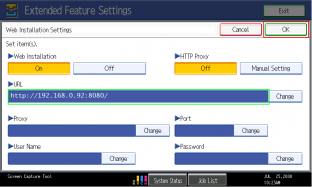 The Settings section is where Ports can be specified as well as several other options for the server. By Default, MOST installs and uses a SSL certificate to transmit encrypted data. By checking "Use Custom Certificate", one can specify their own SSL Certificate to use for data encryption. 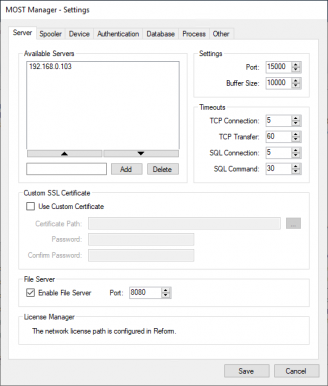 The certificate path would be the location of the SSL certificate PFX file. If required, the password to the certificate can be entered as well. The File Server allows MOST to act as a web server as an alternative method to install MOST (via the built in Web Server). It is also required if a login image is used when installing MOST. These are the directories that MOST will save the output files to for Reform to process the information. Click the "…" button to navigate to a directory, and then click the Add button to add the directory to the list. Local or network directories can be used. If multiple directories are entered, the one with the least files in the Spooler\ImageQueue folder will be used. 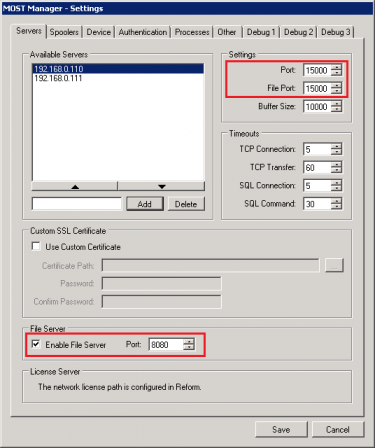 This enables MOST to load balance two Reform Spooler directories using a round robin method. If Enable AutoSize is selected, it will have Reform automatically fit the page to the chosen size when a document is scanned from MOST. 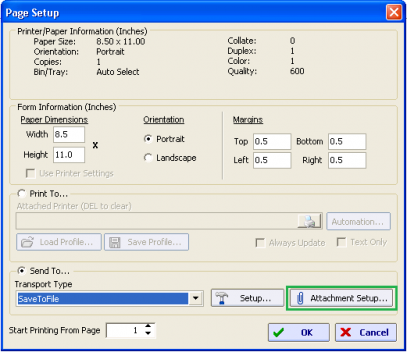 If Enable AutoRotate is selected, MOST will try to auto-rotate the page so it is portrait after it is scanned. If Enable AutoColor is selected, MOST will tell Reform to override any color settings that might be specified in the form configuration. If Enable AutoDPI is selected, MOST will tell Reform to override any DPI settings that might be specified in the form configuration. Enabling remote print allows the MFP to periodically check the server for documents to print. This supports PCL, TIF, JPG, and PS files depending on the machine’s hardware. 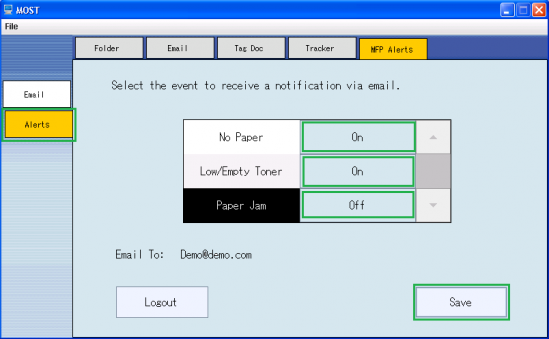 The user can select a directory to use for remote printing. When a MFP connects to the server, a new folder is created with the MFP’s Serial Number. 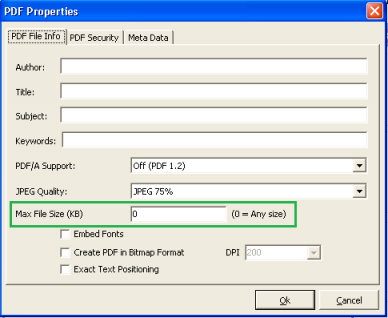 If a file is dropped into a MFP’s folder, the MFP with that Serial Number will print the file. This becomes useful in larger networks when the MFP has access to the server, but the server cannot reach the MFP directly. MOST has the ability to keep track of a user’s copying activity. It also has the capability to lock users out of other MFP Functions (Copy, Fax, Scanning etc) until they log into MOST. After the user logs in, MOST is then able to manage which users or groups have what functions available to them. By default, it will lock users out of all enabled functions. 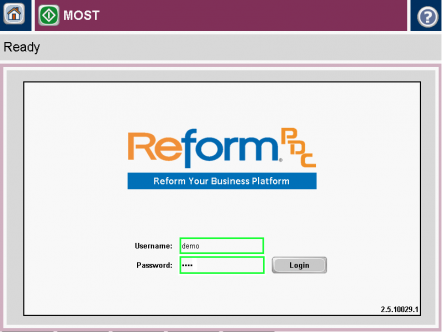 The Reform Tracker plug-in is required to configure which users have access to what functions. 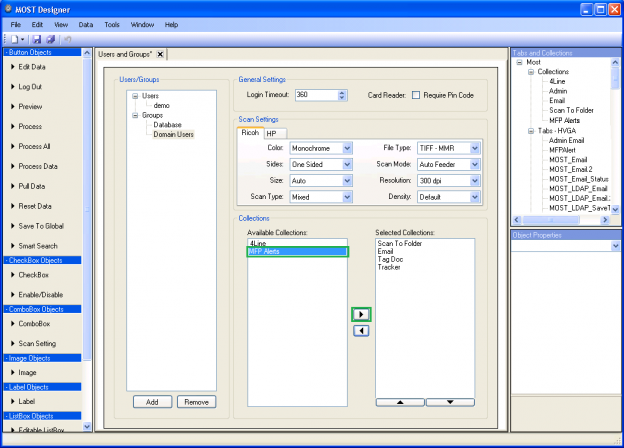 Copy Counter and Function Lock information are also saved in a SQL database. The DSN by default is FSMonitorDataSource which is installed alongside the MOST installation. 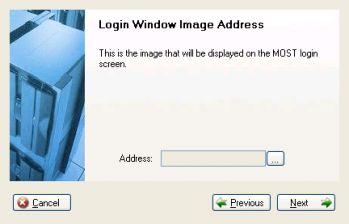 The MFP Username and Password should be the same as the credentials used to log into the MFP’s Web Image Monitor. The "Enable Retry Queue" option is checked on by default. MOST has the ability to determine which jobs may have not completed due to an array of connectivity, network and device issues. If a job is in the middle of being processed and the MFP loses connectivity to the server, MOST is able to save the job in a retry queue on the MFP in order to be attempted again. The MFP will attempt to send the job to the MOST server every 10 minutes which is the Interval and the job will be destroyed if not completed within 360 minutes (6 hours) which is the Timeout. These values can be adjusted depending on your environment. By default, the DSN is set to FSMonitorDataSource for Client Data. 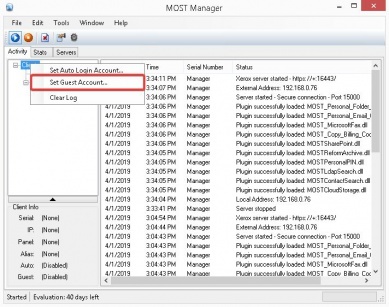 If this option is set to a DSN, MOST will keep track of all MFPs that have connected to the MOST server by Serial Number and IP Address. This is especially useful when using the MFP Control Center to update MOST on the MFPs. 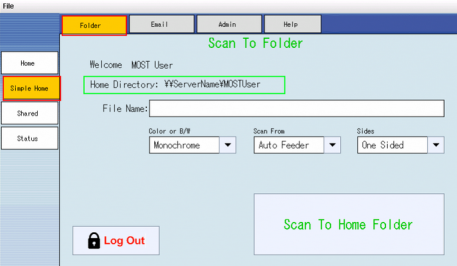 Instead of scanning the network for MFPs, which is a time consuming process, you will have the option to "Scan from MOST Manager" which will retrieve all the IP Addresses and Serial Numbers of previously connected MFPs. This section contains information about the Active Directory, ADAM, or Sun Java System LDAP server types. Enabling this option allows the use of LDAP authentication. 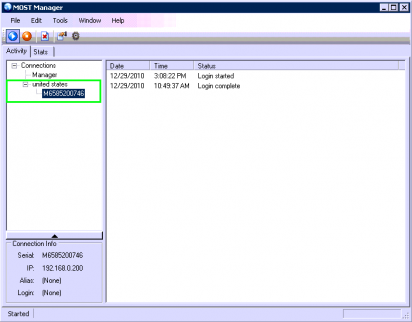 This information is used to authenticate the user’s Windows logon information when he or she logs into MOST from the MFP. Click on the "Fetch" button to retrieve the domain from the Global Catalog. At a minimum, the Domain, Authentication and Server Type are required to access the LDAP system. 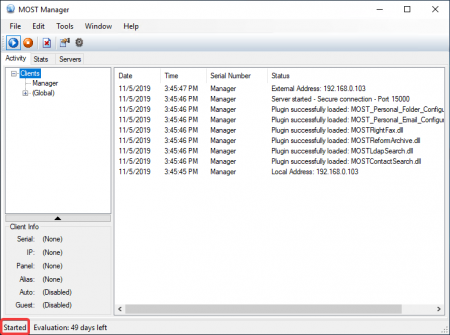 The server can also be entered if multiple LDAP servers exist and you want to connect to a specific one. Enabling the Global Catalog option within MOST allows it to query or authenticate against all of the trusted domains indexed by the Global Catalog. Using LDAP authentication with MOST allows for Collections and Tabs to be easily assigned to certain LDAP Users or Groups (Collections will be discussed later in this document). The following table is a list of LDAP authentication types used in MOST and their .NET equivalents defined by Microsoft. 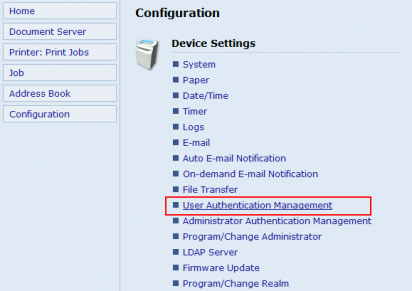 Basic Uses basic authentication (simple bind) in the LDAP provider. Secure Requests secure authentication. 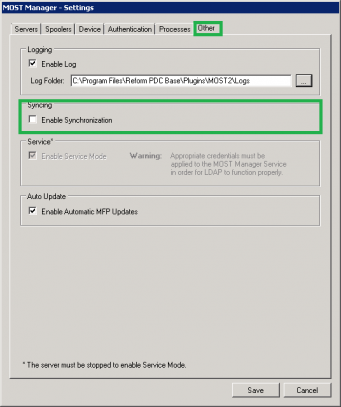 When this flag is set, the WinNT provider uses NTLM to authenticate the client. 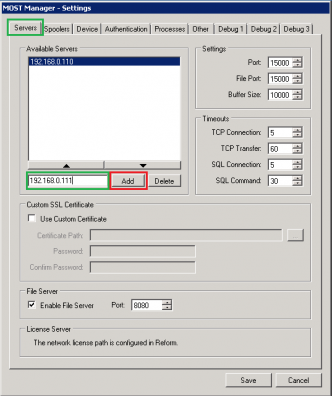 Active Directory Domain Services uses Kerberos, and possibly NTLM, to authenticate the client. 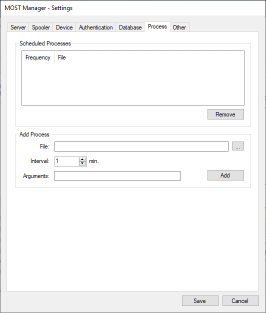 When the user name and password are a null reference, ADSI binds to the object using the security context of the calling thread, which is either the security context of the user account under which the application is running or of the client user account that the calling thread is impersonating. Verifies data integrity to ensure that the data received is the same as the data sent. Encrypts data using Kerberos. Enables Active Directory Services Interface (ADSI) to delegate the user’s security context, which is necessary for moving objects across domains. SSL* Attaches a cryptographic signature to the message that both identifies the sender and ensures that the message has not been modified in transit. Active Directory Domain Services requires the Certificate Server be installed to support Secure Sockets Layer (SSL) encryption. *Using the SSL authentication type will automatically tell MOST to connect to the directory server on port 636. For the other authentication types, port 389 is used. If Global Catalog is selected in the MOST settings, MOST will use port 3269 for SSL and 3268 for the other types. The Authentication box allows you to specify a different user to authenticate to the LDAP server. This may be required to check user’s credentials if MOST is running as a service under the "LocalSystem" account. 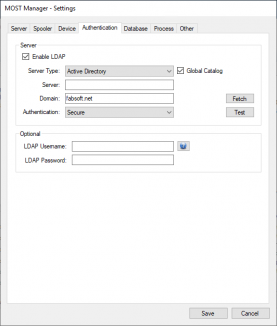 Also, if the default login for a machine is an LDAP username, it may require these settings. Proximity card information is encrypted and stored in a SQL database. The correct SQL database DSN should be selected. By default, MOST installs FSMonitorDataSource and creates a database table for Proximity Card data. "Require Pin Code" forces the user to enter a PIN number when they use their card to login. This section allows you to schedule programs to run periodically. In some instances this is used with MOST plugins to cache data for quicker searching. You can select the program, arguments, and how often the application should run. 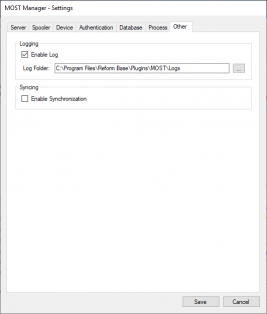 This setting allows MOST to create a log file of all the server activity. The logs will be created in the specified directory. Each day, a new log will be created with the file name similar to: "Most_9-5-2015.log". This option allows MOST to automatically update an MFP when the connecting MFP is an older version. To start the MOST Manager server, click on play button in the upper left. In the Machine Information, it will display the Serial, IP, and Alias of the selected machine. Notice the IP address of the Manager. This IP address is the server IP address used during the MOST login on the MFP. This is also the IP address of the computer hosting the Most Manager. The left side of the panel contains the list of machine serial numbers or machine aliases if an alias is set. The Manager IP address will always be the IP of the computer hosting the MOST Manager. This address is also the IP that will be used by MOST on the multifunctional device. The right side of the panel contains server activity details. The server details can be cleared using the Clear Logs button . 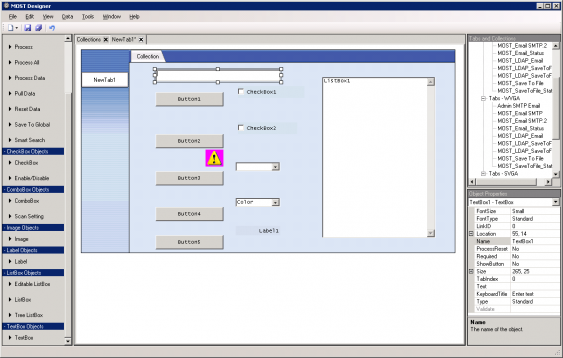 To assign or change the alias for a serial number, right click on the Machine’s Serial Number and choose Set or Remove Alias. Choosing Set will assign the alias to the printer’s serial number. 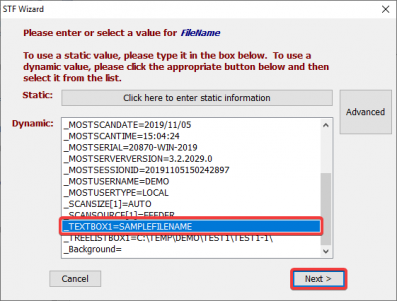 Deleting the alias will display only the Serial Number in the Machine list. The Stats panel in the MOST Manager provides usage information. Specifically, this will display the highest number of connections, the current number of connections and the number of transfers, etc. 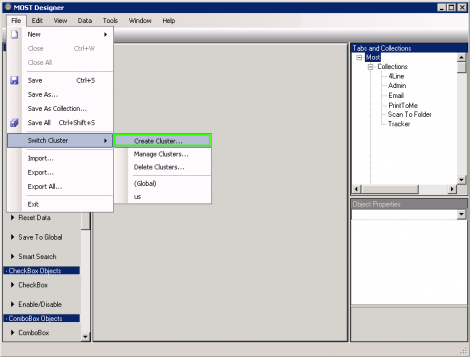 LDAP Viewer NA The LDAP Viewer allows you to search the LDAP server that is specified in the options by specific user or group. Download MFP Log NA Attempts to connect to the MFP using its IP address to obtain a log. Utilizes the rsh command and may not be available on all servers. The MOST Designer is used to create users, groups, Tabs and Collections. The Collections available to an individual are customizable in two ways: through the individual’s Active Directory User name or through the associated group. It is also possible to create a user that exists and only has access to MOST without the need for Active Directory. Different collections may also be assigned to different users. 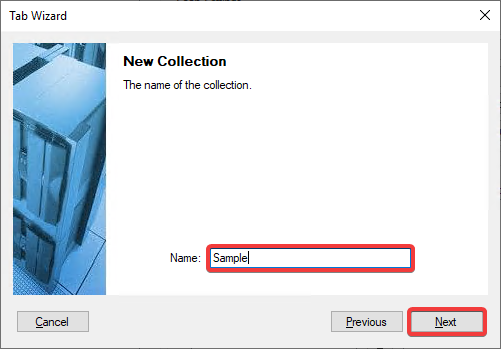 The Collection displayed for UserA may be different than the collections displayed for UserB. MOST will also use Active Directory groups to apply permissions. For example, the group Accounting is configured to view the Front Office and Accounting Collections. If a user from the Accounting group logs into MOST, that user will see the Collections for Front Office and Accounting. To take the concept a step further, if the Manager of Accounting is part of the Accounting group, but also has a special Collection assigned to his username, he would be able to see everything the Accounting group encompasses in addition to his own special Collection. Users and groups are also used in the cost accounting features of MOST. Users and groups can be configured to track, restrict or limit users’ and groups’ access to MFP functions such as copying, faxing, and scanning. From the menu bar, select Data > Users and Groups. To add a user, click on the "Add" button on the bottom of the window. The Add User window will be displayed. Select the user from the list. Note that the available users are a list of Active Directory accounts. A user can also be added to MOST by manually entering a "Local" user. To delete a user, select the user from the Users list and click on the "Remove" button. To add a group, click on the "Add Group" button. The Add Group window will be displayed. Select a group from the list. Note that the available groups are the list of Active Directory groups. Settings configured for a group will apply to all users within the group. To delete a group, select the group from the Groups list and click on the "Remove" button. All users within the selected group will automatically inherit and use the Collections assigned to the group. When a user or group is created, the Default Scan Settings and Collections will need to be configured for that new user or group. 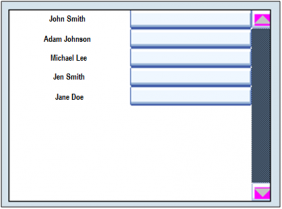 Collections consist of Tabs and can be configured for both users and groups. 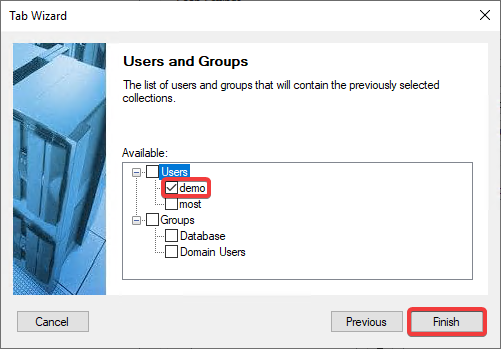 Collections assigned to a group will apply to all users within the Active Directory group. Collections assigned to a user will only apply to the user. To add a Collection or set of Collections, select the Collection from the list in the left panel, then click on the "Add"
button. The selected Collection will appear in the right panel. You can add multiple collections. "Remove" button. The selected Collection will be removed from the right panel and displayed in the left panel. You can remove multiple Collections. Tabs are composed of interface objects geared towards a specific activity. They contain text boxes, drop down menus, buttons, etc. Tabs are self-contained and independent from other Tabs. 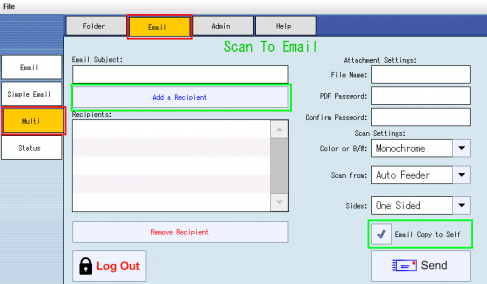 In the diagram below, you will notice a Tab created for each scan activity (Archive, Fax, Email, and Process). A single Tab, or several related Tabs, can be grouped into a single Collection or assorted collections. The diagram below displays three different collections: Front Office, Warehouse and Marketing. Collections are independent of each other, i.e, the Front Office Collection can have entirely different Tabs from the Warehouse Collection. Tabs are included in Collections. Collections are assigned to users and users are organized into groups. In the menu bar, select Data > Collections to access the Collections window. 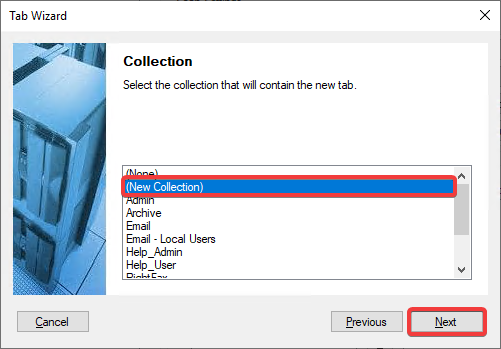 The Collections window will allow you to add new Collections, modify the Tabs associated with the Collection and remove unwanted Collections. Tabs in a collection can be re-ordered using the up and down buttons in the selected tabs field. To create a Collection, click on the "Add" button on the Collections tab. Next, enter a name into the prompt. To add Tabs to your new Collection, select the Tab listed in the "Available tabs" panel. Click on the "Add"
button to add the selected Tab to the Collection. To remove a Tab from a Collection, select the Tab from the "Selected Tabs" panel, then click on the "Remove"
button. You must click on the "Save"
Select a Collection from the Collections drop down menu. The Tab configurations for the selected Collection will appear. Modify the Collection as needed. Click on the "Save"
Select a Collection from the Collections drop down menu. Click on the "Remove" button to delete the selected collection. Alternatively, you can right-click a collection in the Tabs and Collections pane and click Delete. 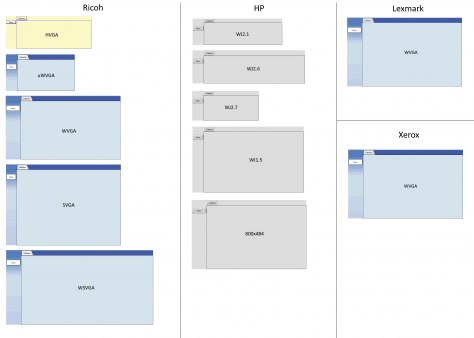 Sample of a Tab with several Tab objects. Note': When you try to open a tab on the MFP, but the screen is smaller than the resolution of the tab, you will get a "Tab not available" error. For example, if the screen is created as a SVGA and you try running it on WVGA, it will say "Tab not available". However, if your MFP screen is larger than the MOST screen that you are trying to use, it will still display the small screen without problems. To modify an existing tab, double click on a tab towards the upper right side of the designer to open it for editing. Right click on a tab to copy it to another screen format, or to delete the tab from the designer. The Save To File Tab opened in the MOST Designer for modification. Exporting tabs to a file can be used to perform simple backups of your MOST tabs, and can also help if you are running multiple copies of MOST on different machines and need the tabs to be portable. To Export tabs, go to File > Export. A window will pop up that allows you to select which tabs you would like exported. 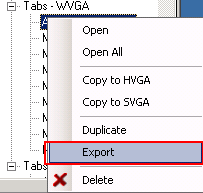 After you have selected the tabs to export, click Export. A save dialog will appear. Give your tabs a name and click Save to save your tabs to a .most file that can be imported via File > Import on other machines. Alternatively, if you would simply like to export all of your MOST tabs, go to File > Export All. This will back up all of your tabs. If you would like to quickly make a backup of a single tab, right-click the entry in the tabs and collections pane and click Export. If you right-click on a collection name in the tabs and collections pane, you will also see an Export command. If you export a collection, it will save all of the tabs in a collection. Use the Import feature to restore backups of your MOST tabs that you have saved from exporting. Go to File > Import. An open file dialog will appear. Select the saved file that you would like to import, and MOST will automatically insert all of the tabs into MOST. If a tab with the same name already exists, you will be asked whether or not you would like to replace the existing tab. When importing collections with the same name, the tabs in the collection will be merged. A Guest account can easily be added to MOST. 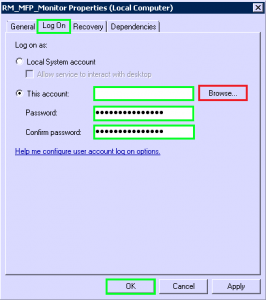 This account is used for allowing logins to MOST even if the guest does not have an Active Directory account. After creating the Guest account, a guest user can login by simply selecting the Guest button on the login screen. To add a Guest account, open MOST Designer and add a collection for the Guest account. Add the Tabs that you want to be accessible for the guest users. See section 3.2 to add and edit collections. Once the Guest Collection is added, now add Guest as a user to the system. See section 3.1.1 to add a new user. Now the Guest account can be added to the MOST Manager. 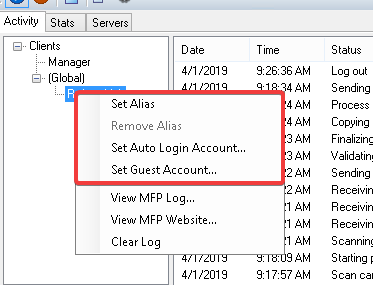 Right click on Connections in MOST Manager and select Set Guest Account, then select [Add User] on the Set Guest Account screen and type ’Guest’ or the desired username. Fill in the Password field as well. The Guest account is ready to use. Login to the MFP or use MOST Desktop to check the Guest account. MOST has many components that can be used to design MFP screens. They are in the list on the left side of the MOST interface. To add components to the current tab, drag them into the workspace from the left frame. Button objects in the MOST Designer look the same, but their functions and properties differ. 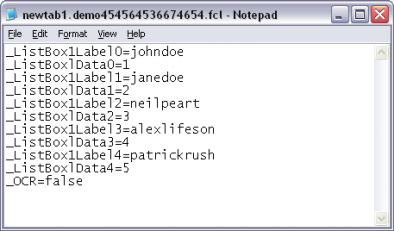 The Edit Data component is used to modify data in one or two ListBoxes. Depending on the requirements, the Edit Data control can delete data from a ListBox, can copy data from one ListBox to another, and can remove data from one ListBox and add it to another. The Method Property is used to change the operation of the Edit Data button. 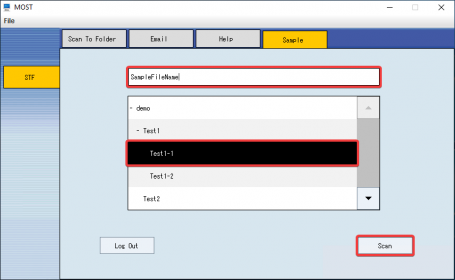 Selecting ’Delete’ will remove an item from the Source ListBox, ’Copy’ will add the selected items in the Source ListBox to the Target ListBox, and ’Move’ will remove an item from the Source ListBox and add it to the Target ListBox. 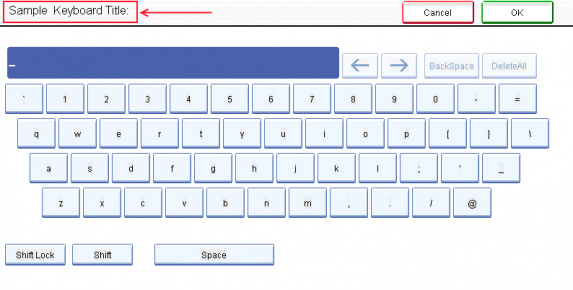 (Keyboard) will allow the user to manually enter a value. The Source and Target properties are pointed to the ListBoxes that will be affected by the Edit Data control. If ’Delete’ is selected as the Method property, you will only need to select the source ListBox. In the example above, clicking on the top move button will remove the item from the left ListBox and move it over to the right ListBox. The bottom move button will move the item from the right box back to the left box. Both Move buttons have their ’Method’ properties set to "Move". 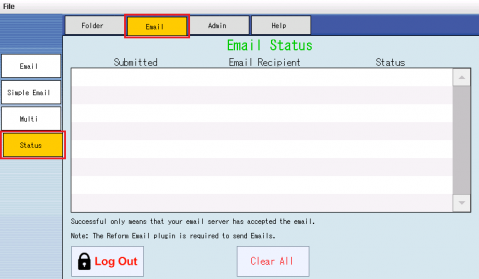 A Log Out button will log off a user who is currently logged in to a MOST server. The Preview component will display a preview of the data that will be sent from the object chosen in the Target property. 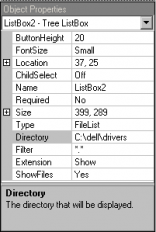 The Target property points to the ListBox object that contains files that can be previewed. 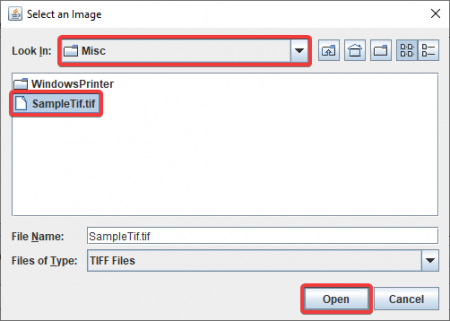 The path to the TIF or JPG file will be retrieved from the ListBox, and it will be previewed on the MFP screen. The Process component will process only the current tab. It will have no affect on other tabs in the collection. the other two tabs in the Collection. If the ’DirectCopy’ property is set to On, a copy of the scanned document will be automatically created. If the ’Continue’ property is set to On, the user will be asked if they are finished scanning or if they want to continue with more pages. If the ’Scan Preview’ property is set to On, it will display a preview of what was scanned after the scanning is complete. The Process All component will process all of the Tabs in the collection that are set to ’Enabled’ on their respective tabs. The Enable/Disable object toggles whether a screen will be processed with the Process All button. If a tab is not enabled, it will not be processed. If the ’DirectCopy’ property is set to On (on the enable checkbox), a copy of the scanned document will be automatically created. If the ’Scan Preview’ property is set to On, will display a preview of what was scanned after the scanning is complete. The Process Data component will generate the files for Reform to process without the scanning process actually taking place. 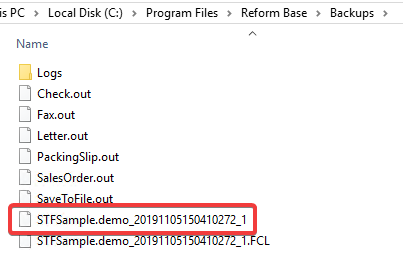 This is what the FCL file would look like that is created in the \Spooler\ folder in the Reform directory. The Pull Data component can pull information out of a database at preset intervals and display the results in a ListBox. The FontColor and FontSize properties are for appearance. The Target property should be set to the ListBox that should be updated with the database results. The Time property is the interval at which the database queries should be sent. The Visible property indicates whether or not the button should be visible on the tab. The Type property can be CustomDatabase, Database, DLL, or FileList. If set to DLL, you need to have certain parameters to pass through in the DesignerValue property. If set to CustomDatabase, you can write customized SQL query statements in the SQL property to send to the database. The results of the query will be populated into the ListBox that is chosen for the Target property. For the MOST variables available for use with a CustomDatabase object, see the CustomDatabase options section of the manual. If Database is chosen, the Table that is specified will be queried at the given time interval repeatedly and the results will be populated into the selected ListBox. You can also edit the SearchField and SearchValue properties if you wish to add search strings to narrow your results. The Save To Global component let’s you change MOST global variables via the MFP screen. Save to Global will update any Global Variables that are in use on the current tab. These Global Variables are defined in the menu Data->Global Variables, and can be attached to a TextBox object or a combobox with a type set to ’Global’ and by changing the ’Variable’ property to the name of the Global Variable. The Smart Search component will query a database based on the properties set, and populates the results into a ListBox chosen in the Target property. When the user presses the button, they will be prompted for input to search for. To change the font size and color, change the FontSize and FontColor properties. If you would like the query to be executed on login, change the AutoSearch property to On. A Smart Search component can either be of Type CustomDatabase, Database, or DLL. If the ’Type’ property is set to CustomDatabase, you must specify the Target, which is the ListBox to populate, the DSN, and the SQL query to execute on the database. For the MOST variables available for use with a CustomDatabase object, see the CustomDatabase options section of the manual. If it is set to type Database, you must specify the Target, the DSN, the table, and the columns to query. When the Smart Search button is clicked on, it will display the on-screen keyboard for the search term to be entered into. After the search query is entered and OK is pressed, it will display the results in the ListBox as specified in the Target property. A Checkbox will send a value of true or false to Reform when a tab is processed depending on whether it is checked or not. 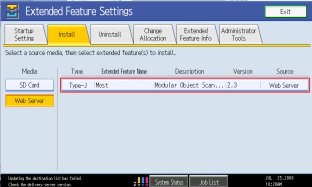 The enable/disable component will allow or disallow access to a tab. If a tab is disabled and a Process All button is clicked, the tab will not be processed. Tab is disabled. Objects are locked. Tab enabled. Objects are unlocked. ComboBoxes can be populated with different types of data depending on the requirements. 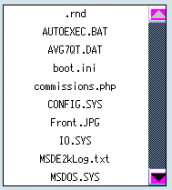 Under the ’Type’ property, you can set it to CustomDatabase, Database, DLL, FileList, Global, Static, or Target. If Global is used, a static list must exist with the same name as the global variable you are trying to add the combo box for. When CustomDatabase is selected, you can specify a custom SQL Query to be executed upon opening the tab. For the MOST variables available for use with a CustomDatabase object, see the CustomDatabase options section of the manual. When FileList is selected, three more properties will appear; ’Directory’, ’Filter’, and ’Extension’. ’Directory’ is the folder that will be scanned for files. The files will be populated into the ComboBox. ’Filter’ can be changed to have only certain kinds of files listed. ’Extension’ can be set to show or hide the file extensions within the ComboBox. With Static selected, the ’Static Data’ property will appear. 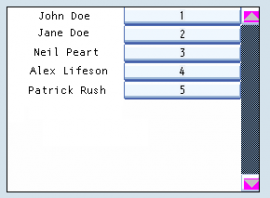 You can then choose a Static Data group to be populated into the ComboBox. Also note that you can specify a default value for the setting by changing the value of the DefaultText property. 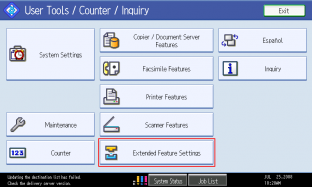 The Scan Setting component can set printer settings from within a ComboBox. In the properties frame, change the ScanType to Color, Compression, Density, FileType, Mode, Resolution, ScanType, Sides, Size. The ComboBox will be automatically populated with the settings. Labels have no dynamic properties; they simply display text. You can change the font size, color, and alignment by changing their properties. ListBoxes can be populated with data that has been pulled from databases, work in sync with other components, and perform a variety of other tasks. The Editable ListBox component is just like a regular ListBox object, you can set values for each item in the list by pressing the button next to the item you want to set a value for. ListBoxes can be used to display different data types. The ’AllValues’ property indicates whether all rows in the list should be returned [Yes], or just the selected row [No]. The ’ButtonHeight’ property specifies the height of the scroll buttons that appear on the ListBox, in pixels. The ’Columns’ property specifies how many columns the ListBox should have. The ’MaxItems’ property sets the maximum number of rows of data that are sent to the client machine at any time. The ’Multiselect’ property, if set to On, allows the user to select multiple rows in the ListBox. The ’Primary’ column will set which column of data is to be returned. The ’ProcessClear’ property, if set to true, will automatically clear the ListBox after the tab has been processed. If the ’Required’ property is set to Yes, the tab will not be able to be processed unless there is an item selected in the ListBox. 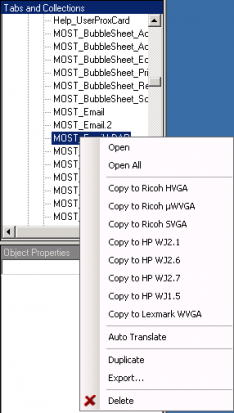 The ’Type’ property has several options; CustomDatabase, Database, DLL, FileList, Static, Target. If set to CustomDatabase, the user must specify a DSN and an SQL query string. For the MOST variables available for use with a CustomDatabase object, see the CustomDatabase options section of the manual. If set to Database, they must specify a DSN, a Table, DisplayFields, which tells which fields to display, HiddenFields, which tells which fields to return but not display, and optionally SearchField and SearchValue, which sets the field to search, and the value to search for. If set to DLL, you need to have certain parameters to pass through to the DLL file in the DesignerValue property. If set to FileList, much like the Tree ListBox, the user needs to set a directory to scan for files, the Filter, and whether or not to show the Extension. If set to Static, the user must select a group of static data. Static Data can be edited in the menu Data->Static Data. 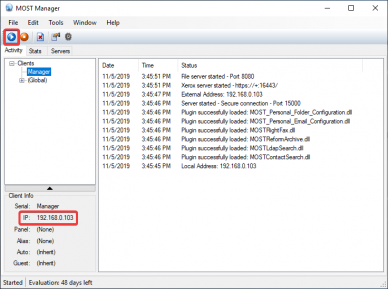 The Tree ListBox component can be used to either display a list of files and folders within a directory in an organized tree view, or it can send parameters to a DLL file that uses the MOST SDK. In the example above, the Tree ListBox has its Type property set to FileList and its Directory set to a folder on the local machine. The ’ChildSelect’ property, if set to On, will only allow sub-items (or Child Items) in the Tree ListBox to be selected by the user. If the ’Required’ property is set to Yes, the tab will not be able to be processed unless there is a file selected in the Tree ListBox. The ’Type’ property can be either DLL or FileList. If it is set to FileList, you must choose the Directory property, which is the location on your local machine to scan for files and folders, the Filter property, which will only show the type of files you would like to see based on the file extension [ie. *.txt, *.jpg], the Extension property, which if set to ’Hide’ will not show the file extensions for any files that are listed, and ShowFiles, which must be set to Yes for files and folders to be automatically populated in the Tree ListBox. If DLL is selected for property ’Type’, then you must have parameters to pass along to the DLL (that uses the MOST SDK) to utilize it. Those parameters should be set in the DesignerValue property. The TextBox component has several properties that can change its functionality. The ’ProcessClear’ property, if set to true, will automatically clear the TextBox after the tab has been processed. The ’Required’ property, if set to true, will not allow the user to process the tab until the field has been filled out. 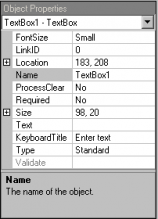 The ’KeyboardTitle’ property specifies what text will be displayed on the top of the on-screen keyboard on the MFP. The KeyboardTitle property specifies what text will go in the top left of the keyboard. The ’Type’ property can be set to ’Global’, ’Password’, ’Standard’ or "Popup". ’Global’ will create a new property called ’Variable’, which should be pointed towards a Global Variable. The TextBox will automatically be filled with the Global Variable chosen in the Variable property. ’Password’ will automatically mask the text that a user enters. ’Standard’ is the default, normal entry mode. 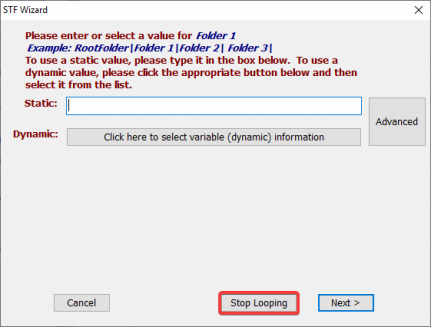 "Popup" allows you to populate the textbox with data that the user selects from a popup box. 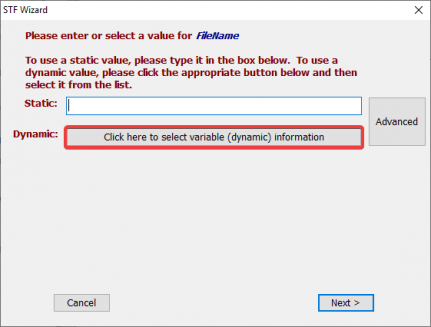 When chosen, additional options will be made available such as Popup Type which allows you to populate the popup screen from a DLL, Database or Static data. If the ’Validate’ property is set to another TextBox, upon processing the tab, the two TextBoxes will be compared for validity. If they do not match, the user will be notified and processing will not continue. Below are the variables available for use in a CustomDatabase query. Wherever one of the below phrases are placed in a SQL Query, the value of the current logged in user/session/device details will be populated. #INPUT# The text entered by the user. Typically used for searching. #DOMAIN# The logged in user's Domain. #USER# The logged in user's Username. #SERIAL# The MFP serial number. #IP# The MFP IP Address. 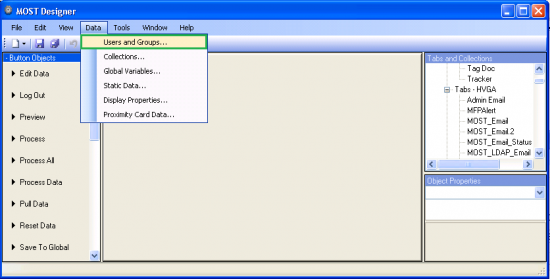 #GROUPS# The logged in user's groups. #PRIMARYGROUP# The logged in user's primary group. #FIRSTNAME# The logged in user's First Name. #LASTNAME# The logged in user's Last Name. #EMAIL# The logged in user's Email address. #TABNAME# The MOST Tab name that is currently displayed. #SESSION# The unique Session ID (per logon). #CLUSTER# The MOST Cluster that the MFP is assigned to. Clusters are useful for isolating configurations on a per MFP basis. Some general scenarios where clusters may be useful are if you would like to have different screens, functionality, or access available for various locations. Using clusters, you can assign specific devices to use different MOST settings. Typically it is recommended to use LDAP groups to control access and functionality, but in cases where device location is the only option, clusters can become a useful configuration technique. 3. Enter the name of the cluster to be created. Click OK.
5. 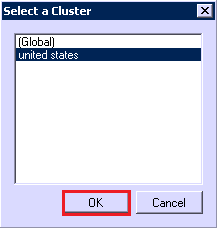 Select a Cluster from the List. 6. Now you will see the Server under the recently created Cluster. 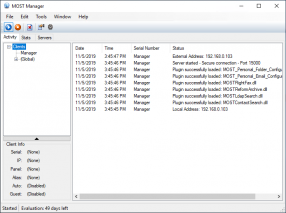 This will scan the IP addresses of the MFPs that have previously connected to the MOST Manager. Only available if Client Data is assigned a DSN in the MOST Manager Settings (Devices Tab). 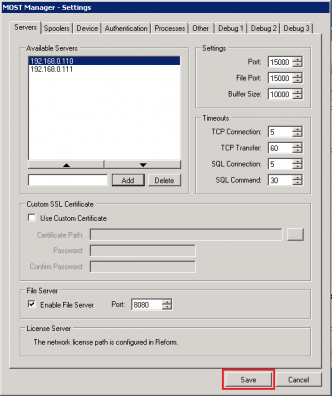 Scan from File NA Allows you to select a text file that contains IP addresses. It will then scan these IP addresses. Exit NA Closes the MFP Control Center. 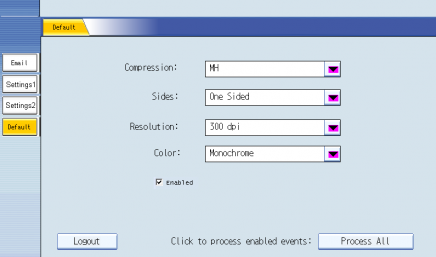 Edit MOST for Ricoh Settings NA Displays the configuration options for Ricoh devices. MOST for HP Settings NA Displays the configuration options for HP devices. MOST for Lexmark Settings NA Displays the configuration options for Lexmark devices. 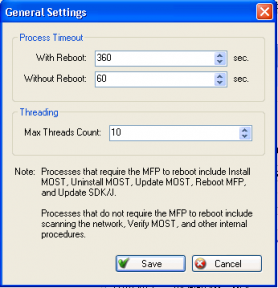 NA Configure Proxy settings and MFP Process timeout settings. NA Uses SNMP to gather additional information from the MFP. 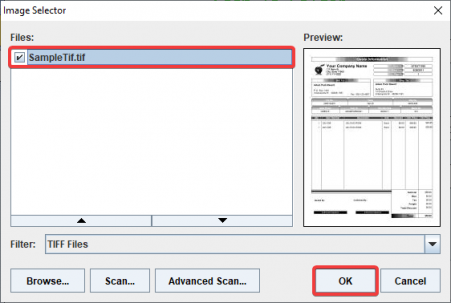 If you have trouble scanning for an MFP, disabling this option may help your results. Ping Mode NA Pings the device prior to scanning the IP address. 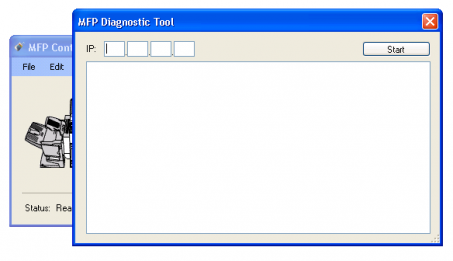 Help MFP Diagnostic Tool NA Tool that verifies the configuration of a device and displays troubleshooting details. Displays the About dialog that contains the version number of the application as well as the version of MOST that it will install. To open the MOST Settings, have the MFP Control Center open and click Edit > MOST for Ricoh/HP/Lexmark Settings…. This will display the settings for the selected manufacturer. Note: Each manufacturer may have slightly different options available. However, the majority of them match regardless of manufacturer. Login Window Linking When you enter the username on MOST, this option can automatically display the password entry, then login. Copy Counter Enables MOST to keep track of copies made while the user is logged into MOST. 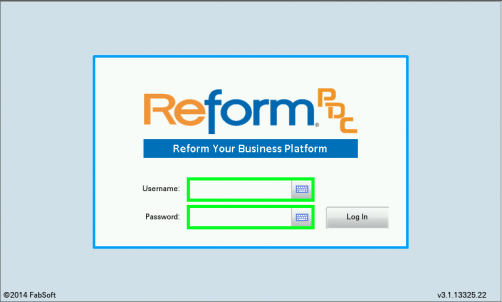 Requires The Reform Tracker plug-in to be installed in order to function properly. MFP Username The same administrative username used to log into the MFP’s Web Image Monitor. 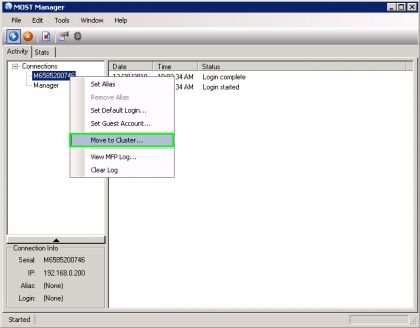 Lock Functions Used to manage and lock users out of the enabled functions until the user logs into MOST. By default, enabling any of these will lock users out without the ability to configure which users or groups have access to what functions. The Reform Tracker plugin is required in order to make these customizations. In order to unlock functions after locking them and installing MOST to an MFP, please see the trouble shooting section of this manual. Card Reader If your proximity card reader is not working correctly, this option attempts to force MOST to recognize the device. Note that this option will cause MOST to use external keyboards as a card reader. Lock Panel Locks the MFP so that only MOST can be accessed. The other MFP options will be unavailable. Interval How often the MFP Monitor (MFP Alerts) will query the MFP for status updates. Set this to 0 to disable MFP Alerts. MIBs The MIB or range of MIB’s (using * wildcard) that the MFP Monitor will query. Available Lists the possible device Models available to force MOST Lite instead of the standard MOST. This option to force MOST Lite is only for devices running Java version 7.x or 10.x and support the 4 line LCD embedded software architecture. Selected Lists the selected device Models to force MOST Lite instead of the standard MOST. Note: Forcing MOST Lite to an MFP that does not support the 4 line LCD embedded software architecture will cause MOST to not install or function properly on that device. To access the General Settings, have the MFP Control Center window open and go to Edit > General Settings. Process Timeout Used to specify a timeout for MOST when installing, updating etc. There are two timeouts, without and without reboot. Please see note. If using a Wide Area Network, both values should be increased accordingly. Max Threads Count Max Threads Count specifies the maximum number of MFPs to be accessed when scanning an IP Range. 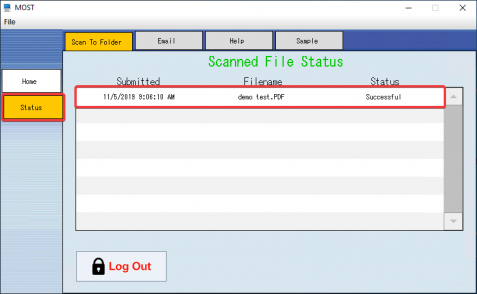 Ricoh MFPs can be automatically detected by specifying a range of IPs to scan. Fill in each box [i.e. 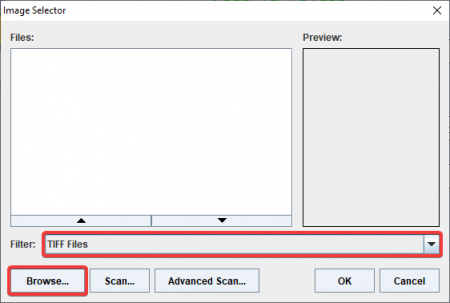 192.168.1.15 to 192.168.1.255] and click ’Start Scan’ to search for MFPs. Once one or more MFPs are found and the scan has finished, press the Next button. On the next screen, it will list all of the MFPs that were found in the scan, and they will be split up into three tabs-the printers that have MOST installed and the printers that don’t have MOST installed on them, and the printers that could not be reached. From the Installed tab you can select multiple printers and verify installations, start MOST, Uninstall MOST, or reboot the MFP. From the ’Uninstalled’ tab you can have MOST installed automatically, and you can reboot the MFP. Also note that if you check the checkboxes next to multiple MFPs, you can perform any task to all of the printers with one click. You can also use the Edit > Select All feature to select all the MFPs. The MFP Diagnostic tool checks if the ports on the MFP are open so MOST can install. 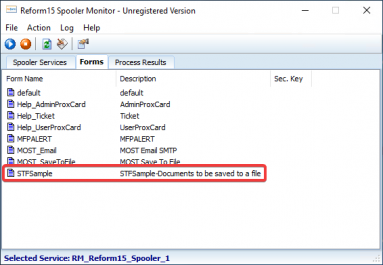 If there is an issue installing on a MFP, use this tool to check the MFP’s ports. 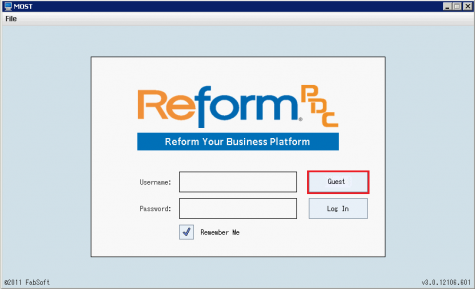 **Important: It is required to have the Reform Email plug-in installed and configured with MOST before attempting to use the MFP Email Alerts. Before continuing with this part of the instructions, be sure that scan to email is functioning with an SMTP email server. MFP email alerts can be used to receive email notifications of issues such as a paper jam, empty toner or no paper occurring at a MOST enabled MFP(s). In order to receive MFP email alerts the RM_MFP_Monitor service must be set to startup automatically, run under the correct service account, and should be currently running. 2. Select Yes to import MFP_Monitor into MOST. This will open the MOST Designer and add the MFPAlert tab to MOST. 4. Select the group that you would like the users that are part of that group to have the ability to receive MFP email alerts. You will need to add the Admin collection to the Selected Collections if not already present. This can be done by selecting MFPAlerts in the Available Collections and click the right arrow to add to the Select Collections. 5. 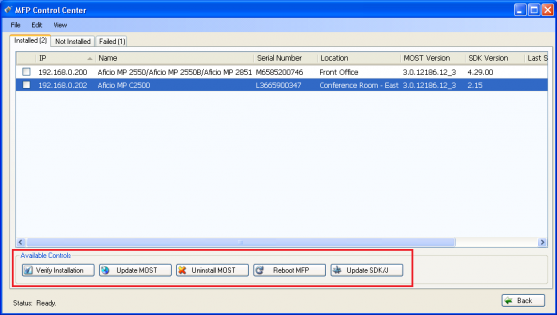 Open the MFP Control Center by going to Start > Programs > Reform… > MOST > Install to MFPs. 8. If the Interval value is set to 0, change the Interval value to 15 seconds. The Interval value must be greater than 0 to receive email alerts. Click Save. If you changed this value you will need to reinstall MOST to the MFP you would like to receive email alerts from. Please see sections 1.2.1, 1.2.2 or 1.2.3 of this manual to install MOST to MFP. 9. Log into the MFP with the same account you would like to receive the MFP email alerts. Select the MFP Alerts collection. Select the Alerts tab from the MFP Alerts collection. You can now click on the type of alert(s) you would like to receive emails for. Click Save. You will now be sent notifications via email for the events you selected for that MFP. 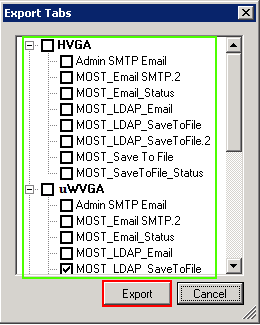 You can repeat step 9 on as many MFPs as you would like to receive email alerts for. Reform will attempt to split the file sizes below the selected amount. However, if you select 100 KB as the limit, and the user scans 1 page that is larger than 100 KB, it cannot be split. There you can enter the Maximum File Size. Once the desired size is entered, click the "Ok" button to close the window, and save the form changes. Tabs: Compilation of interface objects designed for a specific purpose. The tabs are located along the left side of the screen. Tabs can be created and modified. Collections: A group of Tabs. Collections can be modified and customized to include or exclude Tabs. Users and groups of users can have more than one collection. Collections are listed across the top of the console interface. On-screen keyboard: A touch screen version of the keyboard. 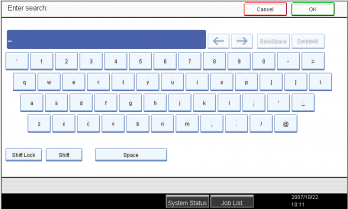 The on-screen keyboard can be accessed by pressing anywhere on an input field. MOST Desktop – The MOST Client that runs on a workstation. MOST resides on the MFP / copy machine (Multi Functional Peripheral or Printer). It communicates with the MFP and interfaces with a distribution service that will process user input and turn it into an automated task. 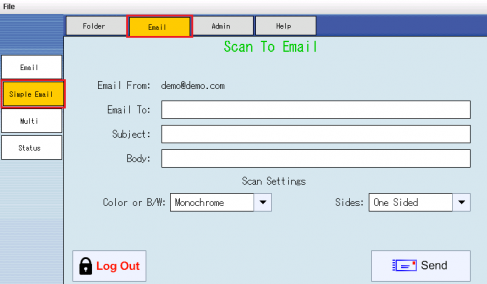 For instance, if a user would like to browse and scan to their home folder, scan to email and scan to a third party application such as fax or archive, MOST can provide the user with a simple or advanced interface to easily accomplish this without having to scan the document more than once. To accomplish this feat, MOST utilizes a modular system of Tabs and Collections. The Microsoft Active Directory user and group permissions are then applied to the Collections or groups of Tabs. Joining two MOST servers should only be done once the servers have been fully tested separately and everything is working as expected. Since joining the servers requires them to have the same configuration, be sure that they are working in the same way prior to following these instructions. Synchronizing servers in MOST will ensure they are configured identically. Best practices also require that the software be installed in the same path on both servers. For example, Reform is installed to C:\Program Files\Reform\ on the first server. It should be installed to this same location on the second server. 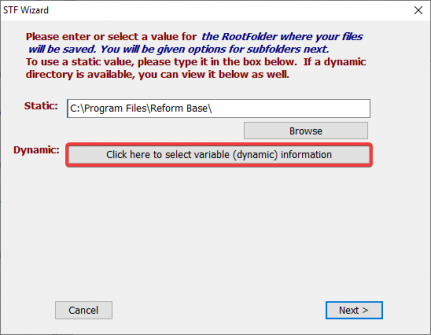 The Compare Reform Folders utility will can compare the files in two folders containing releases of Reform and/or Reform backups. To open Compare Reform Folders, open the Health Monitor by going to Start > Reform > Health Monitor. Next, click the Compare Reform Folders button in the Backup/Restore section on the main screen in Health Monitor. Select two folders to compare by entering them in or clicking Browse and finding them in the file directory. Click Compare and Health Monitor will compare the two of them, showing added, deleted, and modified files. The Second Directory should specify the other server’s Reform location via UNC path. Once it is confirmed that the two servers have the same important files, you can proceed to step 2. On the first server, please open the MOST Manager. Go to Programs > Reform… > MOST > Manager. Click the Edit menu and open Settings. 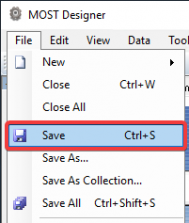 Check the Enable Synchronization checkbox and click Save. A message box will appear asking if you would like to overwrite the settings on the first server, please click No. By doing this, we will maintain the settings from the first server. On the second server, open the MOST Manager and select the Other Tab. Check the Enable Synchronization checkbox and click Save. The message will appear again asking if you would like to overwrite the settings on the second server, this time click Yes. By doing this we are maintaining settings on Server 1 and overwriting the settings on the second server with the settings from the first server. On the first server, open the MOST Manager Settings and go to the Servers tab. In the Available Servers box, please add the second server’s IP Address. Click the Add button. 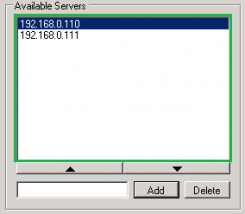 After adding the second server’s IP Address, both IP’s will appear in the Available Servers. On the second server, please open the MOST Manager. Check that both IP Addresses are in the Available Servers box. Showing both IP Addresses mean that the servers are synchronized properly. Test logging into both servers as well as processing jobs through both servers. Login, logout, login, logout. Checking the MOST Manager, the login activity will alternate between servers. Login and scan multiple times without logging out (at least 4 scans). This will force the jobs to alternate between the two servers. Each server will have two jobs on it. The jobs will be processed by Server1, Server2, Server1, Server2 (or just the opposite if Server2 processed the first job). The MFP Alerts Service is installed with the MOST installation and is set to manual start up. 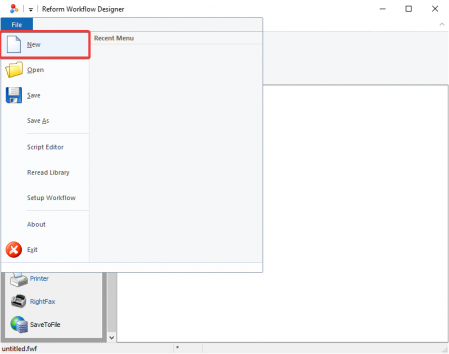 It is required to be running in Automatic startup mode if you are using MFP Monitoring in the Advanced tab of the MFP Control Center. 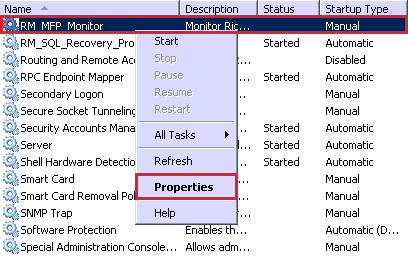 The service is named RM_MFP_Monitor and can be found in Services under Administrative Tools in the Control Panel. The MFP Alerts service should also be run as a domain account with local administrative privileges. To do so, right click on the service and go to Properties. This will bring up the Properties dialog box. First, set the "Startup type" to Automatic in the General tab. Go to the Log On tab. Here you can configure the account to run MFP Alerts as. You can manually type the account name or you can use the Browse… button to do so. After entering the correct account, please fill in the login credentials. Click OK.
You may need to restart the service for the changes to take effect. Close the Services window after you successfully start the service. NOTE: Check the SDK Version column. MOST checks to see which version of MOST and SDK/J is loaded on the MFD. If an update is Recommended it is noted. Select from one of the options. It is recommended to Update SDK/J if an update is available and allows the installation to complete. Next, it is recommended that you Update MOST and allow that to complete. The status will indicate Ready when the installation is complete. 1. 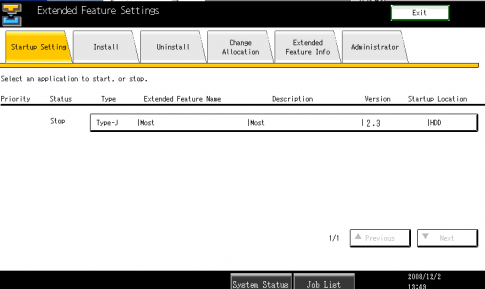 Verify Installation – Checks the current MOST installation for errors. NOTE: Updates may take several minutes. Not Installed Tab - devices without MOST will display. 6) When the installation is done on a clean MFP (Not installed tab), the MFP will disappear from the Not Installed tab and appear in the Installed Tab. The Status at the bottom of the window will also indicate Ready. 7) Once it confirms that MOST has been installed, you can close the MFP Control Center window which has the Installed and Not Installed tabs or click Back. This will take you back to the main window. You can close this window as well. 8) You have completed your installation of MOST on the MFP(s). You can now try logging into MOST from the MFP. If you are having trouble installing MOST using the MFP Control Center or the Remote Control, you may want to try a manual install. This is done through the MFP administration webpage. "C:\Program Files\Reform…\Plugins\MOST\Config\MostJavaClient.zip", so it is important to configure it before continuing. 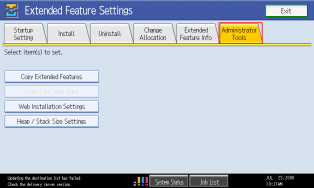 Please see the section titled "Installing MOST on your MFP" to configure the settings. 1) Open an Internet Explorer window on the machine you are installing MOST to and navigate to the IP address/hostname of the MFP you want to install to. On the upper right-hand corner, click Login. Log in to the system with the MFP administration account credentials. 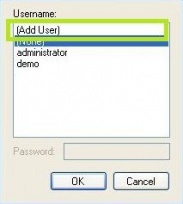 The default login credentials are admin for the username and a blank password. 2) Click the Configuration button on the left hand side of the admin panel. 3) On the next page, scroll down to the bottom-right and select Install under Extended Feature Settings. 5) Click Display Extended Feature List. 6) The administration panel will scan this zip file for extended features to be installed. The zip file you selected contains the MOST files. 7) When the next page loads, there will be an option labeled Install to: Change the selected item in the drop-down menu to SD Card (SD) # or Flash Memory (FM). This will make sure that MOST is installed to the recommended location. If an SD Card is selected, it should be the card that is running Java. 8) The Auto Start feature should be set to On. 9) At the bottom, tick the option button next to Most, and click the Install button. 10) MOST will now be installed to the MFP. After it finishes installing, you can logout and close the MFP’s administration panel. 11) You have successfully installed MOST on the MFP. Configuring the settings in the MFP Control Center allows you to easily adjust the MOST installation settings. This application will update the file "C:\Program Files\Reform…\Plugins\MOST\Config\MostJavaClient.zip", so it is important to configure it before continuing. 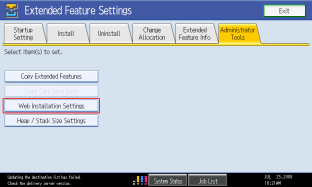 Please see the section titled "Installing MOST on your MFP" to configure the settings. The below instructions do not apply to type-B machines Ricoh . This installation method is not available on devices which do not have Java capabilities. If you have an MFP which is Android only, you must install via the MFP Control Center or from the device's web page. First, be sure that the "Enable File Server" option is set in the MOST Manager Settings. Also, be sure that the MOST Manager is running. If the MFP has physical buttons (non-Android screen), click the User Tools button from the left side of the MFP panel. If the MFP has a Smart Operation Panel (Android screen), log in with the admin account, and then from the Home screen navigate to User Tools > Machine Features. Click on the Extended Feature Settings button. Click on Extended Feature Settings again. Now select the Administrator Tools tab. Click the Web Installation Settings button. In order to install MOST, we need to make sure that the web installation is active; we do this by clicking the On option that is next to Web Installation. We also need to enter the MOST download server URL into the URL field. The address is: http://ServerIPAddress:FileServerPort/ for example: http://192.168.0.92:8080/. The port is based on the setting File Server Port that was configured earlier in the MOST Manager settings. Verify that the URL is correct to your MOST server and press the OK button. Click on the Install tab. You will see 2 options, SD Card and Web Server. Click on the Web Server button. You will now see some options on the right-side of the machine. Click the option that says MOST. 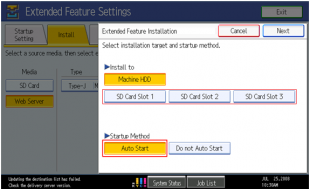 Under the Install to option we are going to select SD Card (SD) # or Flash Memory (FM). If an SD Card is selected, it should be the card that is running Java. There is also an auto-start setting on this screen that is defaulted to on and shouldn’t need to be changed. Click Next and then click OK. In the Startup Settings Tab, Press on MOST to start the application, or restart the MFP to have MOST start automatically. You have successfully installed MOST on the MFP. To start MOST, select the Startup Setting tab from within the Extended Feature Settings. MOST will now appear. Select MOST to start or stop the application. Select "Execute" when prompted. The status will appear in the "Status" column on the left of the screen. Once it is started, press the Exit button in the upper right corner of the screen until you are no longer in the User Tools settings. Starting MOST will bring you to the MOST login screen. First, the MOST Manager must be running or it should be installed as a service and given the correct privileges to operate. On the MFP, press the Scanner button (MOST may be found under a different button if the settings are changed). You will then see the screen below. For the address, you would type the IP address of the server that is running MOST. Select "OK" to close the panel to return to the log in screen. The top input box is for your user name. The bottom input box is for your password. Press the fields next to Username and Password to enter information using the onscreen keyboard. Press the "Log In" button to submit your login information. Once the MFP successfully connects to the server, the Options button will no longer appear at the login screen. First, the MOST Manager must be running or it should be installed as a service and given the correct privileges to operate. On the MFP, swipe your card at the MOST login screen. You will be asked to enter your credentials if this is your first time logging in. Subsequent logins will not ask for credentials. The HP card reader supports up to two card types at any given time. Generally, this is pre-configured and does not need to be changed. However, if for some reason the card reader is not already configured, you can manually set the compatible card types from the MFP Control Center. Open the MFP Control Center. 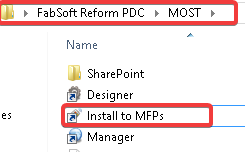 A shortcut to it can be found in a folder on the desktop; FabSoft Reform PDC > MOST > Install to MFPs. Locate the section labeled HP Card Reader. By default, the option for Force Card Types is disabled. Important: enabling this setting will overwrite any settings already configured on the card reader when MOST is deployed to a device. Select the desired card types from the two drop down menus. You may now deploy to an HP device and the card reader will be re-configured to work with the selected card types. For details on how to deploy MOST to an MFP, see Deploying to an MFP. The MOST software is licensed on a Per-MFP basis. One license is required for each MFP and MOST Desktop client that will utilize the MOST product. The server-side software (MOST Manager) is included. MOST is considered a plug-in for Reform. 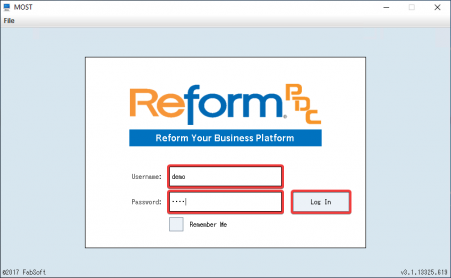 Please see the "Reform Licensing and Registration" section of the Reform User Manual for more information on how to license Reform Plug-ins. After the license is entered, the Reform Spooler and plug-ins will need to be restarted to refresh the licenses. 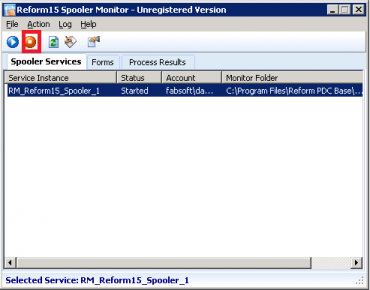 More information regarding the Reform Spooler Service can be found in the Reform User Manual. Once the Reform Spooler is running, the MOST Manager Service should be restarted to read the new license values that Reform had created. Please see the section "Running MOST as a Service" for instructions on restarting the MOST service. The Windows Event Log is a good resource to check if you are experiencing difficulties at any point. It can be accessed by going to Control Panel>Administrative Tools>Event Log. Check for any errors or warning relating to MOST and the various Plugins you may have installed. The information provided in the Event Log should give you more insight to why you are having difficulties. This is caused by a security setting on the MFD which is preventing MOST from loading. To disable it, follow the steps below. Log in to the MFD's web page as admin. Find the setting named Enable Cross-site Request Forgery (CSRF) prevention (under "Embedded Web Server Options") and make sure it is disabled / un-checked. Click the Apply button to save the settings. You will now be able to launch MOST from the device without error. Verify that the MOST Manager Service is running as a domain account with local administrative privileges. See section about running the MOST Manager as a Service for more information. In total, there are a few ports that the MOST Manager uses in order to communicate with the MFPs: Port, File Port and File Server Port. By default, these values are 15000, 15000, and 8080 respectively. The protocol used is TCP. 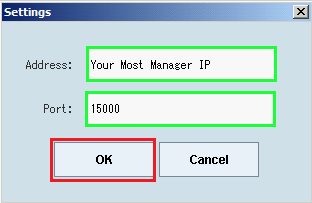 To view or configure which ports the MOST Manager is currently using, open the MOST Manager by going to Start > Programs > Reform… > MOST > Manager. On the menu, click on Edit > Settings. In the Servers tab, you will see the above mentioned ports. These ports (TCP) should be added to your firewall’s "allow" list. The MOST Manager service may also need to be added to our "allowed" applications list in the firewall. Function locks can be enabled in the MFP Control Center before installing MOST onto an MFP. The access these settings, open the MFP Control Center (Start > Programs > Reform… > MOST > Install to MFPs), go to Edit > MOST Ricoh/HP/Lexmark Settings for the device’s manufacturer and navigate to the Device tab. To disable function locking manually, the device’s website must be used. Use your web browser to navigate to http://<Machine IP> i.e. http://192.168.0.200. Click the Login link on the top right of the page. You will be prompted to enter the MFP’s administrator login user name and password. Please do so and click Login. Next, click on Configuration on the left hand side of the window. Now click on User Authentication Management. Scroll down until you see User Authentication Settings. Click OK to apply your changes. The final step is to reinstall MOST onto the MFP. Before doing so, be sure that the lock functions are not checked in the MOST Settings of the MFP Control Center as discussed previously.